If you’d rather not bother with dragging a hefty laptop or a meaty tablet around on your vacation, you’ll probably be more than happy with your favourite Smartphone instead. This fantastic device is not only an excellent way to keep in touch with your nearest and dearest whilst out and about on your travels, but can also offer you a myriad of cool travel and accommodation options before you’ve even landed on the tarmac. We have reviewed 3 essential Android travel apps that will certainly be worth a place in your list of packing items, so please take a few minutes to peruse these goodies and you may be able to download them in tome for your next overseas or domestic jaunt. Undoubtedly one of the most popular and useful trip planning websites ever, TripAdvisor is now available on your Android Smartphone, and we are eternally grateful! It offers some fantastic deals on flights and accommodation, plus restaurants and local attractions are all here in abundance. The real beauty of TripAdvisor is the plethora of real live user reviews that tell you exactly what is going on behind the closed doors and glossy reviews of these places. With over 45 million reviews and some awesome photos, TripAdvisor is one of the best travel applications that we’ve ever seen. 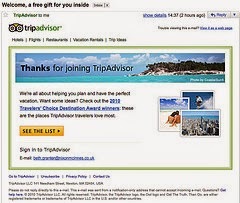 And you can add your own thoughts to the travel website once you’ve sampled the delights for yourself. The travel forums are also a very cool way of finding out local information exactly when you need it. The ‘Near Me Now’ feature is also tailor made for Smartphone travellers and the GPS option allows you to discover any cool restaurants or bars in your immediate vicinity. One of the biggest issues when visiting these far flung shores that offer so much in the way of relaxation and fun, is getting to grips with the local language. So how about an Android App that can bridge that considerable gap with a nice big smile? You can type in the phrase that you want to say, and the application will read it out in the target language on your behalf. The available languages are Spanish, French, German, Italian, Chinese, and Japanese. The developers are promising more languages to be added at a later date. You can also send the translated phrases via text and email, so this is perfect for those foreign language enquiries as well. We would recommend this speech-to-speech translation system for any world travellers that want to get to learn about their host country a little more. Our final Android travelling goodie is certainly worth waiting for, TripIt Travel Organizer is the one-stop application for all things travel related. If you were visiting your montreal locksmith and wanted to sort out the flights, hotels and even car hire, you could do all of that directly from this cool App. You can even check out the weather before you leave your home, we love TripIt and no traveller should leave home without this app! So there you have it, 3 excellent travel applications that will make your next trip special for all the right reasons! Today's featured writer, Nancy Baker, is a freelance blogger, who often writes for Express Locksmith. When she is not busy working, she enjoys surfing and reading. You can follow her on Twitter @Nancy Baker.